We wanted to give you a big overview of metals before we get into details about specific families. Almost 75% of all elements are classified as metals. They are not all like silver (Ag), gold (Au), or platinum (Pt). Those are the very cool and shiny ones. There are other metals like potassium (K) and iridium (Ir) that you might not think about right away. How many kinds of metals are there? So many. Don't even try to memorize them all. Just remember the ones you might need in class. Here's a quick list: Actinide Metals, Lanthanide Metals, Alkali Metals, Alkaline-Earth Metals, Rare Metals, Rare-Earth Metals, and Transition Metals. Remember, that's the easy list. Lucky for you, theperiodic table is excellent at organizing elements, and you will find each of these groups in specific areas of the periodic table. How Do You Identify a Metal? 1. Conduction: Metals are good at conducting electricity. Silver (Ag) and copper (Cu) are some of the most efficient metals and are often used in electronics. 2. Reactivity: Metals are very reactive, some more than others, but most form compounds with other elements quite easily. Sodium (Na) and potassium (K) are some of the most reactive metals. A metal like iron (Fe) forms iron oxide (Fe2O3), which you know as rust. 3. Chemical: It gets a little complex here. Metals usually make positive ions when the compounds are dissolved in solution. Also, their metallic oxides make hydroxides (bases) (OH-), and not acids, when in solution. Think about this example: When sodium chloride (NaCl) is dissolved in water (H2O), it breaks apart into sodium (Na+) and chlorine (Cl-) ions. Do you see how that sodium is the positive ion? Sodium is the metal. It works that way for other metals. Potassium chlorine (KCl) works the same way. When it is dissolved, the potassium ion (K+) is the positive ion. 4. Alloys: Metals are easily combined. 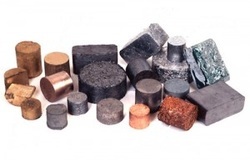 Mixtures of many metallic elements are called alloys. Examples of alloys are steel and bronze.